A RF spectrum analyzer is a device which measures the amount of energy that exists in a range of frequencies. Basically it "listens" to a preset range of frequencies, samples very quickly over time, and draws a graph showing what it "hears". The chart on the left is an example of what a spectrum analyzer outputs. The graph on the right shows what a typical OFDM carrier looks like. It has a sharp rise, a flat plateau, and a sharp drop. The space between the rise and drop is called the occupied spectrum. The height of the graph is the amount of energy for the carrier. The lines on the left and right of the occupied spectrum reflect the ambient noise on the channel. The different between the peak of the carrier and the noise floor is the signal to noise ratio. The greater the ratio the stronger your perceived signal is. The width of the plateau is the channel width. Typically this is going to be 5, 10, 20 or 40 Mhz. So knowing what a normal carrier should look like we can make some basic diagnostics about both the performance of your radio and the environment in which it operates. If the difference between the peak of your carrier and the noise floor is too small, your preceived signal strength will be poor and you may not get good performance. If you see that your carrier is sloped not so steeply or that there are rises above and below the main carrier, your radio may not be tuned properly. We call these side lobes and if they are too large or the signal bleeds outside what you would otherwise expect, your receiver may drop some of the data that fell into that area. We call this clipping. If you see measurements of energy that are outside of your carrier or overlapping your carrier, then you may suffer from interference. Devices like arc welders, electric motors, radar, microwave ovens, cordless phones, hair dryers, electric heaters, and even television sets can create interference for wireless devices. Finding these types of problems is what you use a spectrum analyzer for. 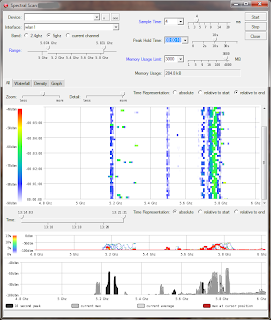 What is a Wireless Packet Analyzer? 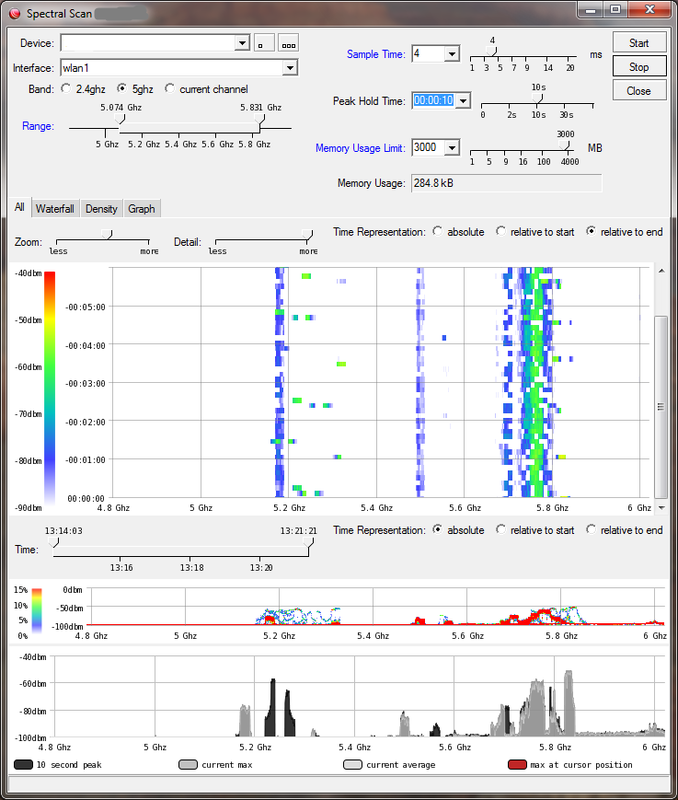 A wireless packet analyzer receives data from a wireless network. It looks for data that is in a very specific format, for instance 802.11 WiFi frames. A packet analyzer will receive all of the packets that it recognizes. But if it does not recognize the data, it will categorize the energy only as noise, nothing more. It does not measure the amount of energy, the pattern of the energy, or tell you where the energy is coming from. A packet analyzer is a powerful tool for picking the right channel, assessing it's capacity, and sorting through issues like packet delay, bit errors, packet storms, intrusion detection, and the like. But it is only good when the problems you face are network related and not RF related. With wireless, unlike fiber and copper networks, once you have installed your network you cannot rely on it functioning properly the next day. Wireless exists in an open environment where things can change from day to day. Unlicensed wireless is even more problematic. Wireless network devices can pop up anywhere within your coverage area, and you can't do anything about it, other than to move out of the way. It is exactly for this reason that, while a site survey before installation is always a good idea, it is more important that your wireless equipment allow you to diagnose and correct BOTH spectrum issues and network congestion/packet issues at any time after installation. Every HauteSpot router includes the capabilities for full packet capture and analysis AND full spectrum analysis. These are very powerful capabilities, particularly when combined with our scripting and SNMP alarm facilities. For instance, we ship sample scripts with every router that allow you to monitor congestion, noise floor, and even run a spectral scan and then take immediate pro-active action to move to a channel with lower congestion, find a channel with less noise, adjust the channel size to avoid interference. As a client node you can script your router to look for alternate master routers to connect to. Other scripts allow you to send emails, SMS, SNMP alarm or TCP message over the network to network administrators for action. The possibilities for making your network truly self healing and self configuring are game changing. The other real value to having integrated spectrum and packet analysis integrated into your installed equipment is that you can do your site survey with the actual equipment you will use, assuring that there is no variation between your measurements and your performance since you are testing with the same gear you install. Why test with a third party product which may not have the same characteristics, sensitivity, or discretion as the equipment you will use, when you can test with the equipment you will actually use? A good spectrum analyzer like those from Aniritsu or Agilent can cost tens of thousands of dollars. If your business is commissioning devices for cellular carriers or the like, then this may be a great investment. But if you are a security installer, you can't afford this luxury. If you need to prove regulatory compliance, then a calibrated (annually) spectrum analyzer is required. A uncalibrated system like what is built into our routers is good for operational use, but is not appropriate for compliance testing. If you buy routers that have good, meaningful spectral analysis capabilities, and the intelligence (through scripting) to act on the reports from your analysis the you will have the infrastructure you need to react quickly, and cost effectively, to changes in your wireless environment as they occur. Often without even having to go on site. Is wireless networking done with PEO Networking?? ?